COLLEGE STATION – Beef with reasonable marbling and juicy taste is preferred among consumers, and industry leaders continue to monitor how to consistently produce a product with these traits. A recent research article addresses the biology and biochemistry of beef marbling and its effects on production systems, carcass and fat quality. The research was funded by the Beef Checkoff Program and can be found online at http://bit.ly/1EwH8x6. In the research article, Smith and Johnson discuss how as more cattle fatten and put down marbling, the fat becomes healthier because there is a replacement of saturated fats with oleic acid. Smith said Johnson looked at gene expression associated with fat development. In general terms in transitioning from pasture or grass feeding, to feedlot feeding there is profound increase in genes associated with fat development and making more oleic acid, Smith said. 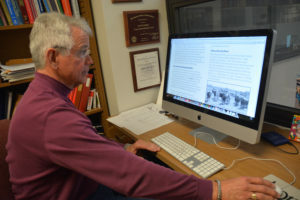 Smith said within the article they describe the published ground–beef studies and how ground beef affects cholesterol in humans. “In most studies, ground beef increased high-density lipoprotein (HDL) cholesterol – the good cholesterol – in men and women,” he said. As fat increases, it is accompanied by a decrease in the proportion of saturated fatty acids and trans-fatty acids with a corresponding increase in oleic acid and other monounsaturated fatty acids. “The more cattle fatten, (the more) they put down more marbling and the more healthful the beef is,” Smith said. Both Smith and Johnson said they wondered why. Randomized, controlled studies evaluated individuals who consumed ground beef formulated from long-fed, grain-fed steers for five weeks (five patties per week), compared to consumption of regular ground beef – lower in oleic acid. HDL cholesterol increased significantly in normocholesterolemic men and postmenopausal women fed the high-oleic acid ground beef. In these studies, the men consumed ground beef containing 24 percent fat and the women consumed ground beef containing 20 percent fat. The conclusions were that, even at these high levels of fat intake, ground beef had no negative effects on lipoprotein cholesterol metabolism in men and women, and ground beef naturally enriched in oleic acid had positive health benefits.